The sensational three-piece music band Chvrches has its origin in Glasgow, Scotland. The trio became prominent in the UK with the release of their debut EP Recover EP in March 2013, just two years after their formation. The band cemented their status with the release of their debut album, The Bones of What You Believe in September 2013. Contained in this debut album was their first official single “The Mother We Share” which charted favorably in the UK and beyond. Following their successes for the year, Chvrches was ranked 5th on BBC’s annual music poll “Sound of 2013” and they have remained consistent ever since. Their second album, Every Open Eye, was released in 2015 and three years later, their third album Love Is Dead was released. This Scottish music band was originally formed as a studio project in September 2011. 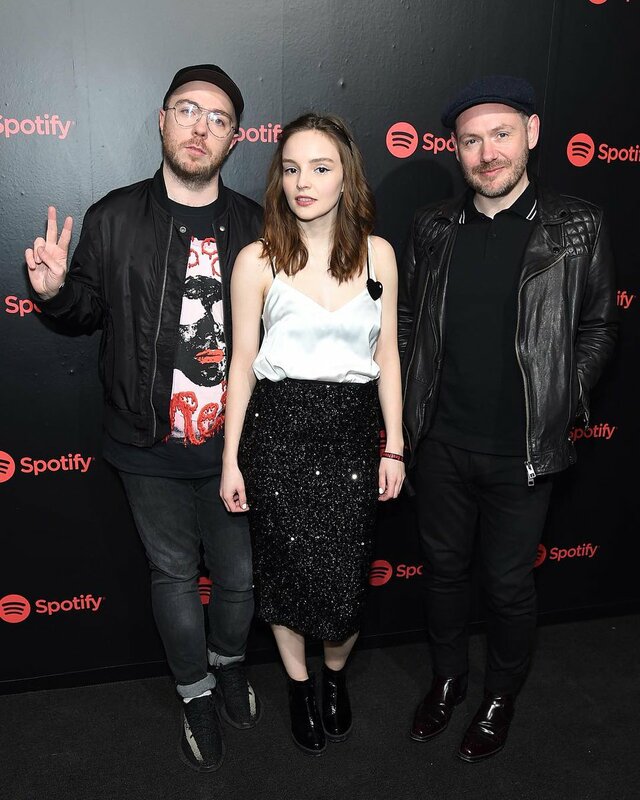 The band is made up of Iain Cook, Martin Doherty, and Lauren Mayberry. Cook and Doherty had met several years earlier while in college and had performed together in a rock band called Aereogramme. Mayberry joined the two much later in September 2011. The trio initially began writing and recording their own songs in a basement studio and when they eventually decided to start performing as a group, Mayberry was chosen to be the lead vocalist and frontwoman owing to her exceptional singing abilities. Doherty performs backing vocals and sometimes lead vocals while Cook performs mainly backing vocals. Iain Andrew Cook was born in November 1974 in Glasgow, Scotland. He is a music composer, producer, and singer. Beyond his duties as a member of Chvrches, he equally composes songs for film and television. As a young adult, Cook performed under the moniker Johnny Dymes for a music band called Les Tinglies. He co-founded the rock band Aereogramme in 1998 and they released up to 4 studio albums before parting ways in 2007. He was also a member of another rock band – The Unwinding Hours between 2008 and 2012. Martin Clifford Doherty was born in December 1982. Being a multi-instrumentalist, he plays the keyboards, the sampler, and the guitar. He toured with the rock band The Twilight Sad in the 90s and he later became the lead vocalist of another rock band – Julia Thirteen (1999-2006). He met Iain cook while attending the University of Strathclyde and joined his band – Aereogramme. Lauren Eve Mayberry was born in October 1987. She is a singer-songwriter and the lead vocalist of Chvrches. She equally plays the drums and the keyboards. Before delving into music, Mayberry bagged an undergraduate law degree at the University of Strathclyde followed by a Masters degree in Journalism. She worked briefly as a freelance journalist before joining Iain Cook and Martin Doherty to form the group Chvrches in late 2011. See Also: David Lee Roth Net Worth, Who Are The Wife And Children Or Is He Gay? 1. Chvrches recorded up to 9 singles within their first few months of working together. They released the first of those singles, “Lies”, in May 2012 through a blog. The single had a positive reception as it received regular airplay both on SoundCloud and BBC Radio 1. 2. The band had its first official live performance at the Glasgow School of Art in July 2012 through which they caught the attention of several record companies. 3. They released their first official single “The Mother We Share” in November 2012 followed by another single “Recover” in February 2013. “Recover” was included in the band’s debut EP Recover EP which was released in March 2013 while “The Mother We Share” became the lead single off their debut album The Bones of What You Believe which was released in September 2013. 4. The band began touring in 2013 including a series of international performances. They eventually returned to the studios in early 2015 to begin work on their second studio album. The album Every Open Eye was released in September 2015 and it went on to top music charts in their home country of Scotland and also in the US. 5. For their third studio album, Chvrches worked with producers like Greg Kurstin and Steve Mac and this marked the first time they would have an outsider contribute to their music. The album Love Is Dead was met with positive reviews after it was released in May 2018 and similar to their preceding album, it topped the Billboard Top Alternative Albums chart and the Billboard Top Rock Albums chart. The album equally peaked at No. 11 on the Billboard 200.